Black boxes date back to the early 1950s, when, following plane crashes, investigators were unable to arrive a conclusive cause for the accidents and deemed it necessary to install the said recorders on aircraft. 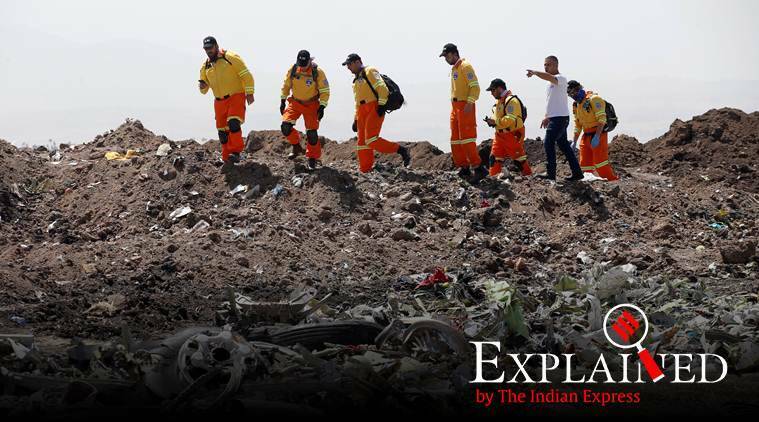 In a major development towards finding the reasons behind the Ethiopian Airlines crash, “black boxes” of the ill-fated Boeing 737 MAX 8 flight were found outside Addis Ababa. Most aircraft are required to be equipped with two black boxes — the cockpit voice recorder (CVR) and the flight data recorder (FDR) — that record the information about a flight and help reconstruct the events leading to an aircraft accident. While the CVR records radio transmissions and other sounds in the cockpit such as conversations between the pilots and engine noises, the flight data recorder records more than 80 different types of information such as altitude, airspeed, flight heading, vertical acceleration, pitch, roll, autopilot status etc. Ethiopian Airways crash: What are black boxes, how will they help find answers? The black boxes, which are actually two orange metallic boxes containing the recorders, date back to the early 1950s, when, following plane crashes, investigators were unable to arrive a conclusive cause for the accidents and deemed it necessary to install the said recorders on aircraft. In the initial days of the black box, the information was recorded on to a metal strip, which was then upgraded to magnetic drives succeeded by solid state memory chips. These recording devices are stored inside a unit that is generally made out of strong substances such as steel or titanium and are also insulated from factors such as extreme heat, cold or wetness. To protect these black boxes, they are equipped towards the tail end of the aircraft – where usually the impact of a crash is the least. There have been cases where planes have crashed into water bodies. To make black boxes discoverable in situations where they are under water, they are equipped with a beacon that sends out ultrasound signals for 30 days. However, in certain cases – like the Malaysian Airlines MH370 flight – the recorders aren’t found despite all the redundancies. In the US, the CVR recordings are treated with extreme sensitivity. According to the US National Transportation Safety Board (NTSB), due to the highly sensitive nature of verbal communications inside the cockpit, the US Congress has required that the Safety Board not release any part of a CVR audio recording. “Because of this sensitivity, a high degree of security is provided for the CVR audio and its transcript. The content and timing of release of the written transcript are strictly regulated: under federal law, transcripts of pertinent portions of cockpit voice recordings are released at a Safety Board public hearing on the accident or, if no hearing is held, when a majority of the factual reports are made public,” the NTSB has noted.